Infective endophthalmitis is an ophthalmic emergency with the potential of causing blindness.1,2 The usual intravitreal antibiotic treatment includes a combination of vancomycin and aminoglycosides, such as amikacin or gentamicin.3–5 Ceftazidime is also frequently administered instead of aminoglycosides, together with vancomycin with acceptable antibacterial efficacy and low toxicity.6,7 However, vancomycin and ceftazidime are incompatible upon mixing, with precipitate formation.8 This effect has recently been explored with checkerboard titration and equilibrium dialysis. We showed that ceftazidime precipitated to a significant extent, especially when prepared in balanced salt solution plus (BSS Plus), with resultant free antibiotic concentration being significantly reduced to a level of less than the MIC90 of the drug against many organisms.9 Such antibiotic concentration would be inadequate for the treatment of a potentially blinding disease like infective endophthalmitis. In view of the potential usefulness of ciprofloxacin as an alternative to ceftazidime in the treatment of infective endophthalmitis, we investigated the precipitation process of a mixture of vancomycin and ciprofloxacin by checkerboard titration and equilibrium dialysis in various fluid media. All experiments were conducted in duplicate, and the mean values taken for analysis. Vitreous was obtained from donor cadaver eyes with prior informed consent. The age of the donors ranged from 65 to 75 years, and the time of preparation was within 1 hour of the death of the donors and stored at −80°C immediately after collection before experimental use as a pool. The degree of syneresis of the pooled vitreous was visually low. Dosages of vancomycin (Abbott, Chicago, IL, USA) and ciprofloxacin (Bayer, Germany) were 1.0 mg and 0.2 mg respectively, prepared in 0.1 ml of 0.9% normal saline (Otsuka, Guangdong, China) or balance salt solution plus (BSS Plus, Alcon, Fort Worth, TX, USA). The vitreous volume of an adult emmetropic human eye is about 4 ml, giving a respective empirical concentration of 0.25 mg/ml and 0.05 mg/ml for vancomycin and ciprofloxacin when injected into the vitreous. The actual concentrations would be different, depending on the extent of precipitation and the actual vitreous volume. Ciprofloxacin was assayed by high performance liquid chromatography (HPLC)16 and vancomycin by a fluorescence polarisation immunoassay (Abbott TDx, Abbott Laboratories, Diagnostics Division, Abbott Park, IL, USA). Standard mixture solutions of 1.0 mg vancomycin and 0.2 mg ciprofloxacin in 0.1 ml of 0.9% normal saline (NS) or balanced salt solution plus (BSS Plus) were mixed separately with 4.0 ml of NS, BSS Plus, and vitreous for incubation at 37°C. Mixture samples with various concentrations of ciprofloxacin and vancomycin prepared in NS or BSS Plus were incubated at 37°C in microtitre plates (table 1) with cover by paraffin foil. Aliquots were taken at 24 hours and 72 hours for assays by HPLC (ciprofloxacin) and TDx (vancomycin) to determine the concentration and amount of free drugs. Equilibrium dialysis studies were performed in an equilibrium dialyser (Spectrum Medical Industries, Los Angeles, CA, USA) with a half cell working volume of 1.0 ml. Vancomycin (125 μg) and ciprofloxacin (20 μg) were prepared in NS and added into half cell chamber A which was separated from half cell chamber B by a semipermeable Spectrapor dialysis membrane with a molecular weight cut off at 6000–8000 D (Spectrum Medical Industries). Both chambers were filled with 1.0 ml of vitreous. The whole system was incubated at 37°C. Aliquots were taken from half cell chamber B at appropriate time intervals up to 168 hours for antibiotic assays. The experiment was then repeated with the antibiotics prepared in BSS Plus and incubated to 192 hours. Precipitate was visually detected in NS, BSS Plus, and vitreous after incubation for 1 day at 37°C. There was no change in pH before or after precipitation. Vancomycin alone in NS showed no visual precipitation. No measurable decrease was detected at an initial concentration of 31.25 mg/ after 24 and 72 hours of incubation. At higher initial concentrations, the measurable loss ranged from 0%–20%, median 9% (first rows, table 1B–E). Ciprofloxacin alone showed visible precipitation in all wells. Its concentration decreased by 15%–33%, median 25%, after 24 hours of incubation, and 8%–32%, median 20%, after 72 hours (first columns, table 1D and E). 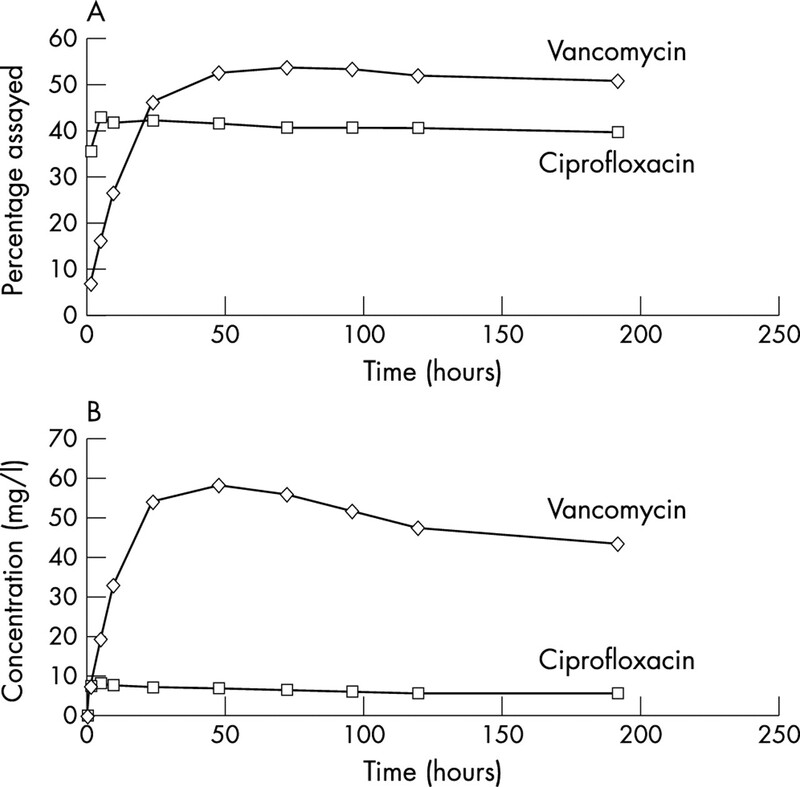 In mixtures of ciprofloxacin and vancomycin there were similar losses in vancomycin by 0%–25%, median 7%, after 24 hours and 0%–25%, median 0%, after 72 hours of incubation, suggesting the loss of vancomycin was minimal and independent of ciprofloxacin. Ciprofloxacin loss was 14%–45%, median 25%, after 24 hours, and 7%–40%, median 26%, by 72 hours, indicating persistent precipitation (table 1B–E). When prepared in BSS Plus, vancomycin alone precipitated from 1%–9%, median 4%, after 24 hours. After 72 hours, the loss was 0.03%–19%, median 7% (first row, table 1H and I), suggesting minimal vancomycin loss. It was independent of whether NS or BSS was used, since the difference in the amount of vancomycin in NS or BSS Plus was insignificant before and after incubation (Student’s paired t test). For ciprofloxacin alone, the loss was 0%–8%, median 3%, after 24 hours of incubation. After 72 hours, the decrease was up to 75% where the initial ciprofloxacin concentration was highest at 25.0 mg/l. At lower initial concentrations (12.5 mg/l–3.125 mg/l), the ciprofloxacin loss was 2%–9%, median 5%, (first column, table 1I). In mixture with vancomycin, ciprofloxacin precipitation was 0%–26%, median 4%, after 24 hours (table 1H). After 72 hours, great loss of ciprofloxacin was observed at an initial high concentration of 25.0 mg/l (range: 69%–78%, median: 74%). At lower concentrations, the loss was 0%–20%, median 7% (table 1I). First the antibiotics were prepared in NS and injected into dialysis chamber A which was filled with vitreous. 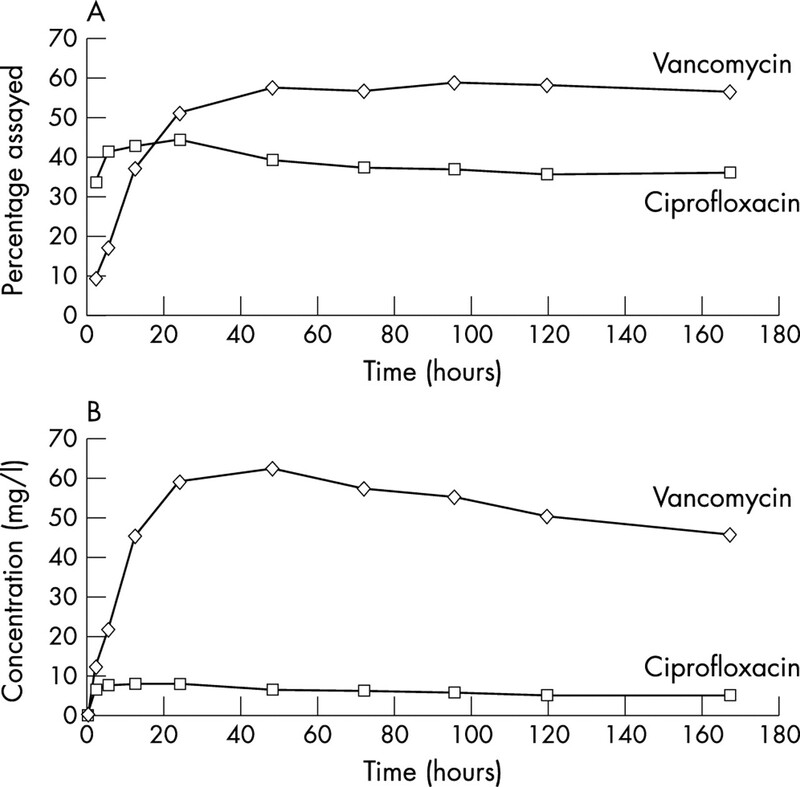 The vancomycin concentration in chamber B rose to about 50% of its original concentration in chamber A after about 24 hours and then plateaued off, showing no loss up to the end of the experiment at 168 hours. For ciprofloxacin, its concentration rose to about 41% in chamber B by 5 hours, then there was a further small rise in concentration to about 44% at 24 hours, afterwards it slowly declined to 36% by the end of the experiment at 168 hours (fig 1A). This suggested a small initial loss of ciprofloxacin by 10%, which slowly increased to about 30% by 168 hours. The concentrations of ciprofloxacin during equilibrium dialysis were 7.97 mg/l by 5 hours and 4.94 mg/l by 168 hours (fig 1B). The duplicate experiment with the antibiotics prepared in BSS Plus showed similar results (fig 2). Equilibrium dialysis in vitreous medium with vancomycin and ciprofloxacin initially prepared in normal saline. (A) Percentage change in concentration in vitreous of chamber B. (B) Actual change in concentration in vitreous of chamber B.
Equilibrium dialysis in vitreous medium with vancomycin and ciprofloxacin initially prepared in balanced salt solution plus. (A) Percentage change in concentration in vitreous of chamber B. (B) Actual change in concentration in vitreous of chamber B. In summary, ciprofloxacin precipitates in vitreous, but to a much lesser extent than ceftazidime. This process is independent of the medium, so there is no need to avoid the use of BSS Plus during preparation of the antibiotics nor during intraocular surgery like pars plana vitrectomy.23,24 Vancomycin and ciprofloxacin in a mixture is stable since precipitation is mild. Such stability not only provides an alternative treatment regimen for infective endophthalmitis, but also may avoid frequently repeated intravitreal injections compared with less stable agents. Dosages of vancomycin and ciprofloxacin at 1.0 mg and 0.2 mg respectively, prepared in 0.1 ml of 0.9% normal saline or BSS Plus, are recommended. Meanwhile, a toxicity study should be conducted to ascertain whether ciprofloxacin poses toxicity effects to the human eye. Callegan MC, Engelbert M, Parke DW 2nd, et al. Bacterial endophthalmitis: epidemiology, therapeutics, and bacterium-host interactions, Clin Microbiol Rev 2002;15:111–24. Roth DB, Flynn HW Jr. Antibiotic selection in the treatment of endophthalmitis: the significance of drug combinations and synergy. Surv Ophthalmol 1997;41:395–401. Endophthalmitis Vitrectomy Study Group. Results of the Endophthalmitis Vitrectomy Study. A randomized trial of immediate vitrectomy and of intravenous antibiotics for the treatment of postoperative bacterial endophthalmitis. Arch Ophthalmol 1995;113:1479–96. Campochiaro PA, Lim JI. Aminoglycoside toxicity in the treatment of endophthalmitis. The Aminoglycoside Toxicity Study Group. Arch Ophthalmol 1994;112:48–53. Aaberg TM, Flynn HW, Murray TG. Intraocular ceftazidime as an alternative to the aminoglycosides in the treatment of endophthalmitis. Arch Ophthalmol 1994;112:18–19. Lim JI, Campochiaro PA. Successful treatment of gram-negative endophthalmitis with intravitreous ceftazidime. Arch Ophthalmol 1992;110:1686. Campochiaro PA, Green WR. Toxicity of intravitreous ceftazidime in primate retina. Arch Ophthalmol 1992;110:1625–9. Lifshitz T, Lapid-Gortzak R, Finkelman Y, et al. Vancomycin and ceftazidime incompatibility upon intravitreal injection. Br J Ophthalmol 2000;84:117–118. Kwok AKH, Hui M, Pang CP, et al. An in vitro Study of ceftazidime and vancomycin concentrations in various fluid media: implications for use in treating endophthalmitis. Invest Ophthalmol Vis Sci 2002;43:1182–8. Hooper DC, Wolfson JS. Mode of action of the quinolone antimicrobial agents: review of recent information. Rev Infect Dis 1989;11:S902–11. Eliopoulos GM, Gardella A, Moellering RC Jr. In vitro activity of ciprofloxacin, a new carboxyquinoline antimicrobial agent. Antimicrob Agents Chemother 1984;25:331–5. Walker RC. The fluoroquinolones. Mayo Clin Proc 1999;74:1030–7. Wiechens B, Grammer JB, Johannsen U, et al. Experimental intravitreal application of ciprofloxacin in rabbits. Ophthalmologica 1999;213:120–8. Hainsworth DP, Conklin JD, Bierly JR, et al. Intravitreal delivery of ciprofloxacin. J Ocul Pharmacol Ther 1996;12:183–91. Jim LK. Physical and chemical compatibility of intravenous ciprofloxacin with other drugs. Ann Pharmacother 1993;27:704–7. Chan CY, Lam A, French GL. Rapid HPLC assay of fluoroquinolones in clinical specimens. J Antimicrob Chemother 1989;23:597–604. Han DP, Wisniewski SR, Wilson LA. Spectrum and susceptibilities of microbiologic isolates in the Endophthalmitis Vitrectomy Study. Am J Ophthalmol 1996;122:1–17. Irvine WD, Flynn HW, Miller D, et al. Endophthalmitis caused by gram-negative organisms. Arch Ophthalmol 1992;110:1450–4. Ling TK, Liu EY, Cheng AF. A 13-year study of antimicrobial susceptibility of common gram-negative bacteria isolated from the bloodstream in a teaching hospital. Chemotherapy 2001;47:29–38. Benz MS, Scott IU, Flynn HW, et al. In vitro susceptibilities to antimicrobials of pathogens isolated from the vitreous cavity of patients with endophthalmitis. Invest Ophthalmol Vis Sci 2002;43:E-Abstract 4428. Kunimoto DY, Das T, Sharma S, et al. Microbiologic spectrum and susuceptibility of isolates: Part I. Postoperative endophthalmitis. Am J Ophthalmol 1999;128:240–2. Kunimoto DY, Das T, Sharma S, et al. Microbiologic soectrum and susuceptibility of isolates: Part II. Posttraumatic endophthalmitis. Am J Ophthalmol 1999;128:242–4. Moorhead LC, Redburn DA, Merritt J, et al. The effects of intravitreal irrigation during vitrectomy on the electroretinogram. Am J Ophthalmol 1979;88:239–45. Edelhauser HF, Van Horn DL, Aaberg TM. Intraocular irrigating solutions and their use for vitrectomy. Monograph 1976;2:265–87.